Tanesha C -- a.k.a. ButterSoulFly -- has made a name for herself in the Detroit area as the host of the successful Mocha Mahogany Mixers, and is certainly a very capable MC. But her real talent is in her stunning poetry, as she displays on her self-released spoken word debut, But Her Soul Flies. With sparse but smart musical support from friends like Gerry Butterwick and Bilal Malik Mutawassim, she let's loose on an album that alternatingly speaks of heartache and triumph, but with a common message of independence and empowerment that is squarely aimed at African-American women. So the striking lover's ode for meaning, "Wish It Was Political," fits nicely near the more traditional message in "Emancipation of Barbie." 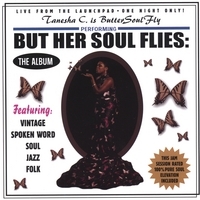 But Her Soul Flies is particularly impressive because Tanesha's message, whether militant or spiritual, is always accessible. A nice beginning to a recording career.